Madrigal Lofts is an upscale Washington, DC condo development in the Mount Vernon Triangle neighborhood. Delivered in 2007, this modern 12-story glass and steel tower has a distinctive look with a rounded front corner and numerous bays and balconies. There are 259 true loft residences in the complex. Located at 811 4th Street NW near the corner of Massachusetts Avenue, this building is part of a recent sea change in the Downtown area. 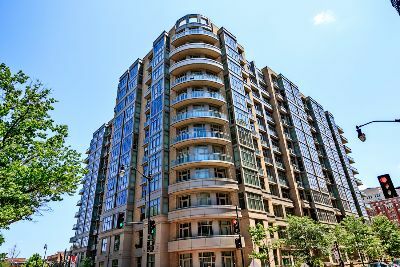 Also associated with the overlapping 20001 zip code areas of Chinatown and Judiciary Square, this particular community has seen a huge redevelopment trend, with new luxury condos for sale, plus lots of new retail and entertainment. The one and two-bedroom residences at Madrigal Lofts have recently listed in a range between $379,900 and $765,000. That said, units don’t come to market often. These attractive lofts are quite spacious, from 720 to 1445 square feet. Many of the units have dens and all feature balconies. The rounded wraparound corner terraces are especially appealing. Inside you’ll find open designs, honey maple hardwood floors, floor-to-ceiling commercial grade windows and exposed duct work. The luxury baths have porcelain soaking tubs, and the designer kitchens are completely open to the living space, with granite counters, stainless steel appliances and oversized maple cabinets. This pet-friendly building also has a huge contemporary lobby with a secured front entry, and a twenty-four hour front desk and concierge service. Residents also enjoy a fitness center, party room, parking, extra storage and a wonderful rooftop deck with four commercial grade gas grilles, lounge areas and views of the city. And then there’s the exciting surrounding community with a WalkScore of 95/100 and easy access to two nearby Metro Stations. The Madrigal Lofts are just steps from Chinatown and the Verizon Center, and also right by the shops and restaurants at City Vista. That means the recently opened Safeway, Vida Fitness, and so much more. The building is also convenient for those toiling in the government center—the US Capitol is just six blocks south!